If it were not for an elegant design, your DNA might be a tangle of crossed lines and knots. Graduate student Erez Lieberman-Aiden was part of a team that discovered how the genome packs information accessibly into a tiny ball of hierarchical folds. One of the enduring puzzles of biology is how our large, complex genomes function, let alone fit, inside the cramped compartment of a cell’s nucleus. The total DNA in a human cell—roughly two meters in length—is somehow packed into an organelle just a hundredth of a millimeter in diameter. Even more impressive, the cell is able to locate, access, and transcribe genes within this dense bundle. Now a study published in Science describes how researchers at Harvard and the University of Massachusetts Memorial Medical Center used a new technique to create a three-dimensional map of the human genome, revealing how DNA pulls off this stunning feat of organization. 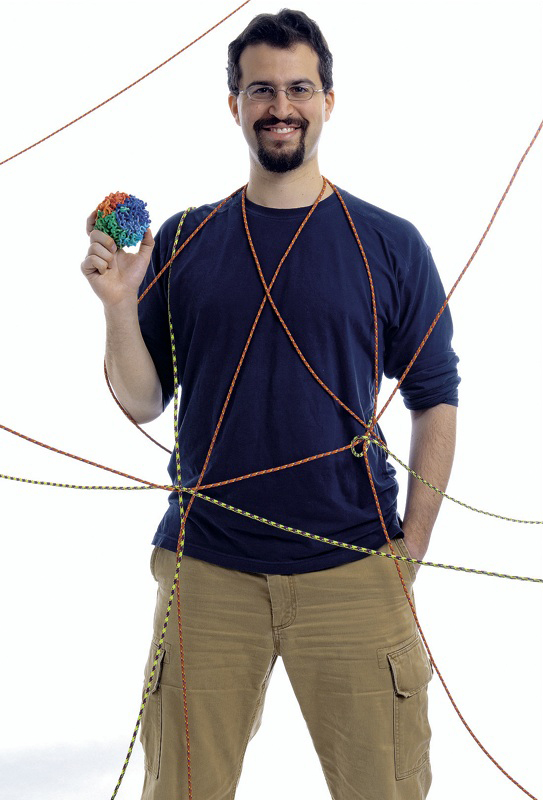 Erez Lieberman-Aiden, a Harvard graduate student and co-first author of the paper, says, “The challenge we face with the genome is that it occupies a nether region where a lot of our technologies don’t work very well.” At the smallest scale, scientists know that human DNA forms a double helix, and that this helix is wound around proteins to form condensed bundles. On a larger scale, we know that long stretches of bundled DNA are divided into individual chromosomes that are visible under a microscope only occasionally, when they compact into a classic X-like structure during cell division. The area between these two scales has been difficult to study with existing techniques. Eric Lander, professor of systems biology and director of the Broad Institute of Harvard and MIT, partnered with Job Dekker, associate professor of biochemistry and molecular pharmacology at UMass Medical School to solve the problem. Postdoctoral fellow and co-first author Nynke van Berkum of UMass and Lieberman-Aiden led the development of a technique called Hi-C, adapted from technology previously developed in Dekker’s lab. It uses formaldehyde to “freeze” the position of DNA in the nucleus by gluing together DNA strands that are near one another. The DNA is then broken into many pieces, which are then sequenced to reveal the identities of DNA sequences close to one another in space. The process is repeated for millions of cells and the results averaged to create a spatial, three-dimensional model of DNA in cells. The researchers discovered a feature about the overall organization of DNA that helps explain how individual genes are accessed. DNA is grouped into two compartments in the nucleus: one, loosely packed, that contains active genes; another, densely packed, where inactive genes lie. It’s been known that DNA unwinds somewhat to make genes accessible, but the new study suggests that DNA actively snakes its way to different parts of the nucleus depending on whether genes are needed or not. Lieberman-Aiden compares the system to a work space: the genes that are active are like files loosely spread out on a desk; unneeded genes are like files packed and stored in a file cabinet. In addition, the team discovered how DNA manages to compact itself into the nucleus. Lieberman-Aiden was looking for a physical model that could explain the group’s data when he found the answer: in a 1988 physics paper predicting that a molecule similar to DNA could form a structure resembling a Peano curve—a fractal design discovered in 1890 by an Italian mathematician that allows a continuous curve to densely fill a space without ever crossing itself (see the image right). DNA, it turns out, crumples into a hierarchical series of folds that enable it to pack densely without forming knots or tangles. The researchers call this structure a fractal globule. And Lieberman-Aiden says it makes perfect sense as a way to manage the information in the genome. “If I was trying to build a library, I’d want the volumes to be compact in one place, I’d want them to be organized, and I’d want them to be accessible,” he explains. A fractal globule allows the genome to follow these same principles. Although the current study provides a fundamental insight into genome organization, Dekker says the “resolution of the current spatial map we’ve built is not high enough.” Right now, the map is at the level of a single megabase, or one million base pairs—the equivalent of breaking the entire genome into 3,000 pieces. It will require many more iterations of the technique to be able to resolve structure on a smaller level. Lieberman-Aiden says other scientists “have realized that this type of approach to studying the three-dimensional structure of the genome is really quite transformative.” An improved three-dimensional map of DNA’s structure could help answer questions about how genes work that aren’t apparent in the genome sequence—for instance, how genes are controlled by other DNA sequences in the genome called regulatory elements. These stretches of DNA often are not adjacent to their target genes in sequence, but they may turn out to be close together in physical space. The researchers also plan to study how the DNA map varies among cells from different species and among different cell types. The mapping technique could even offer new insights, they believe, into differences between cells that are healthy and those that are diseased.